Expats and second-home owners here are enjoying miles of wide, sandy beaches… warm, crystal-clear waters… and one of the most convenient and hassle-free experiences you’ll find outside the United States. I’m spending the week in Puerto Peñasco, Mexico, known to English-speakers as Rocky Point. At the top of the Sea of Cortez, we’re just 62 miles from the U.S. border. The fine sandy beach in this part of town is 4.5 miles long, and almost 200 yards wide in places at low tide. The waters here are clear, completely calm, and the most swimmable I’ve ever seen, with a very gradual, fine-sand bottom. The water temperature today is 86 degrees (30 Celsius). And since they boast 362 days of annual sunshine in this area, there’s little chance that your stay will be spoiled by bad weather. Best of all, two-bedroom condos on this beach start at just US$109,000. Puerto Peñasco remained an unknown fishing outpost until the 1920s when Arizonan John Stone opened a hotel and casino targeting Americans who wanted to escape prohibition. 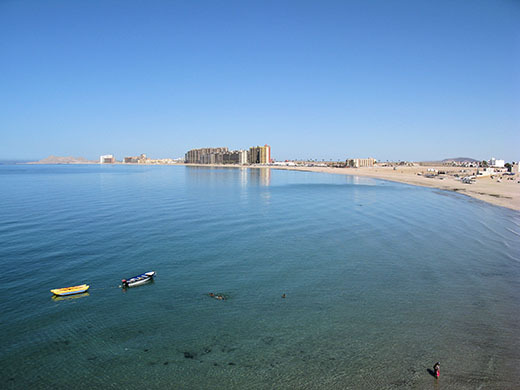 The town is known as Puerto Peñasco in Spanish and Rocky Point in English. Surprisingly, it had its English name first, named so in 1826 by a retired Royal Navy admiral who was in the area scouting for precious metals. In the 1930s, the Mexican president renamed the town to Puerto Punta Peñasco, later dropping “Punta” from the name. Any discussion of Puerto Peñasco has to start with the fact that it’s only 62 miles (100 km) from the U.S. border—just over three-and-a-half hours by car from Phoenix, Arizona or six hours from San Diego, California. Once you cross the border in Lukeville, Arizona, you enter a “Hassle-Free Vehicle Zone,” a program under which you can drive your car into certain parts of Mexico without a vehicle permit (although you still need Mexican auto insurance, available immediately online with a credit card). Alternatively, you can fly to Phoenix and either rent a car or take a shuttle to Puerto Peñasco. Virtually everyone you’ll deal with in Puerto Peñasco speaks English. If your Spanish skills are limited (or nonexistent) you’ll still get by in Puerto Peñasco… although I’ve been treated more like a non-tourist and learned a lot more about living in the area when using Spanish. There are plenty of expats in the town, and you can count on the fact that most of your neighbors will be from Arizona or California. To top off the convenience factor, you can spend U.S. dollars here. I don’t think I’ve bought anything here yet—except gasoline—that I couldn’t have purchased with dollars. But you’ll often save money by buying in pesos, as you’ll be taking advantage of the dollar’s current exchange rate advantage. The claim of 362 days of sunshine per year may not be much of an exaggeration, given that Puerto Peñasco sits on the edge of the Altar Desert… one of the driest and hottest in the Americas. You’ll appreciate the brilliant sunshine and pleasant temperatures… until July gets here. Then you’re in for three months of hot and sometimes humid weather. I believe the precise meteorological term is “hot as hell.” This morning when I got into the car it was 104 degrees Fahrenheit (40 Celsius)… and humid. By October however, the pleasant weather will return for another great high season. The malecón—the name for the seafront lane, promenade, or boardwalk in much of Latin America—has tons of shops and restaurants. We go there most days for dinner to enjoy the breeze, have drinks on the deck, and watch the sun go down. But I found the presence of vendors and tour guides annoying. I suspect that after your first few visits as a resident, you’ll enjoy the beaches and the off-beach local scene and only head to the malecón when you have out-of-town visitors (and you’ll have plenty of those this close to the border). We Americans often overlook Mexico, simply because it’s right next door. Sometimes it feels too convenient in our minds to qualify as an overseas adventure. You can drive. One of the biggest hassles when you have a home abroad—especially a part-year residence—is getting there and back. In Mexico, you can just pack up the car, throw the dog in the back seat, and go. They’re a culturally familiar neighbor. Having lived in South America since 2001, I’d forgotten Mexico’s familiarity, which shows up in many small ways… like eating enchiladas instead of guinea pigs… or seeing full-size, V8 American pickups and SUVs on the road instead of those wimpy Chinese pickups. In Puerto Peñasco you’ve also got familiar stores like Sam’s Club, Auto Zone, and Burger King. The markets in many areas of Mexico are depressed. The Great Recession took its toll in Mexico, especially in the areas popular as second-home markets. Even today many have still not recovered. And what’s more, Mexico has not had the best of publicity over the past six years or so. The Great Swine Flu Epidemic fizzled after a few cases, but its legend lasted for years. And the drug violence in some border cities (and beyond) has affected the perception of the entire country. The dollar is strong. At today’s exchange rate of 16.8 pesos per U.S. dollar, prices are cheaper in Mexico than they’ve been in a long time. Real estate in Puerto Peñasco most often trades in U.S. dollars, but the strong dollar makes all of your other costs less-expensive. It’s hard to spend more than 50 bucks on a nice dinner for two, including drinks. Just north of town you’ll find the 4.5 mile Sandy Beach… creatively named for the sand on it, I suppose. Here you’ll find condos starting at US$109,000, and going to over $800,000, depending on the level of luxury that comes with the development. Single homes in a planned community start at US$175,000 with a water view. 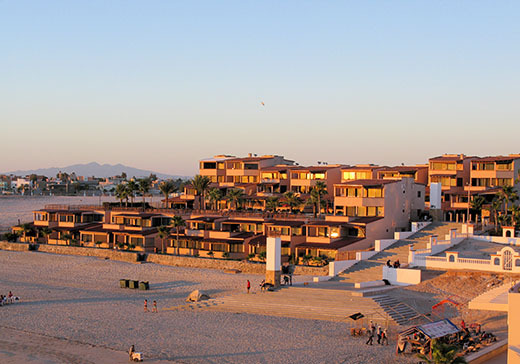 Many consider the Las Gaviotas condos to have the best location in Puerto Peñasco. I would agree. Right on the sand, they’re in the most walkable location of all the condo projects on Sandy Beach. There are several units for sale at this time and all have two bedrooms, two baths, and 1,100 square feet of living space. The asking prices range from US$109,000 to US$144,000. You can have a look at the US$109,000 Las Gaviotas condo here (http://www.rockypointrealestate.com/Puerto_PenascoRocky_Point/Sonora/Condos/14-755/Las_Gaviotas/Agent/Listing_144835564.html). To see the entire Las Gaviotas complex, have a look at the photo below (taken from my hotel room window). In the Casa Blanca Resort, a 1,003-square-foot condo in a more upscale property with lots of amenities is selling for US$149,000. The white, Mediterranean-style homes in this complex come with a fitness trail, covered parking, barbecue areas, poolside kitchen, and an 18-hole putting course. Property taxes on this one are just US$125 per year. Costa Diamante is a private beachfront community of villas, so it’s a good option for those who prefer a private house to a condo. Here we found a 1,800 square foot two-story home with three bedrooms and two-and-a-half baths. Completely furnished and equipped, the asking price is US$239,000. Las Conchas is the largest private community we looked at, located just south of the malecón. It’s a beachfront development of larger villas. Thanks to the natural rise of the land most homes off the beach still have a nice ocean view. One such house was a three-bedroom, three-bath home built in 2000, with an attached garage. Modern and well-kept, it offers ocean views and great sunsets. The asking price is US$249,000. Take a look at these Las Conchas units here (http://www.rockypointrealestate.com/Listing/ViewListingPhotos.aspx?BackEmailTypeID=NONE&ListingID=165953375). We looked at one smaller beachfront house for US$279,000 (http://www.rockypointrealestate.com/Puerto_PenascoRocky_Point/Sonora/Homes/14-656/Las_Conchas/Agent/Listing_140298966.html), but otherwise, prepare to spend around US$450,000 and upwards to be on the beach in Las Conchas. The agent I worked with in Puerto Peñasco is John Walz, (U.S. cell: (520)-904-3344; Mexico cell: (01152)-1-(638)-107-1737) of Realty Executives (http://www.Rockypointrealestate.com). John can answer any questions you have on these properties or others. Is Puerto Peñasco Right For You? Puerto Peñasco—aka Rocky Point—has a lot going for it, aside from the miles of beautiful wide beaches. It’s close to the States, in the “no-hassle vehicle zone,” so you can drive there easily. You can also spend dollars and speak English. I didn’t particularly like the downtown areas or the tourist atmosphere on the malecón… but I felt that the beautiful beaches, warm clear waters, and low prices made up for the lack of an attractive downtown. The properties are inexpensive, even right on the beachfront. 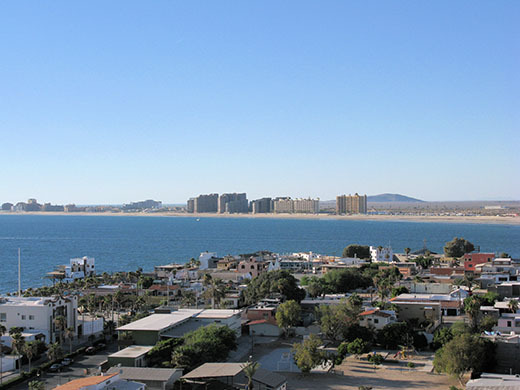 Property taxes in Puerto Peñasco will only run from US$125 to US$300 per year for a beachfront home at today’s exchange rates. If you’re looking for a convenient getaway with pleasant winter temperatures and lots of sunshine, then Puerto Peñasco may well be right for you. Lee’s article on Álamos, Mexico was interesting and informative. And I can relate to being a minority member of an expat group principally organized by women. In Sinaloa, Mexico, I went on the field trip bus “with the gals” (mostly) from Mazatlán to the new Costco in Culiacan, which by the way, was just like the Costco at home in Orlando! If you would like to experience the expat life on a visit, the group Friends of Mexico and trip leader LaVonne Turcotte are very welcoming. One quick question for Lee on Álamos: As your account mentions the hills in the town, what climate advantage does the town get from the difference in altitude than, say, being right on the ocean? Generally, a rise in altitude will lower the temperature 1 degree Fahrenheit for every 275 feet of altitude, or 1 degree Celsius for every 150 meters. Álamos’s altitude is 400 meters (1,300 feet), so all else being equal, Álamos should be 5 degrees cooler than the coast (or 3 degrees Celsius). And it is indeed cooler than nearby low-altitude cities like Ciudad Obregón. But when comparing Álamos to a coastal city like Mazatlán, you have to consider the moderating effect of the cool Pacific Ocean. At the end of the day, the average temps in Mazatlán and Álamos are almost the same. Interesting article on the Canadian Dollar. One little thing… as an Albertan, the author’s use of the term “tar sands” sends a negative message to many people here. It speaks to your credibility. The use of “tar sands” rather than the more acceptable term “oil sands” subtly identifies him as an ignorant anti-oil-sands know-it-all that is not worthy of any attention. Matt Chilliak wrote a good article on Canadian real estate but left out an important detail in my humble opinion. What can one charge for rent in the cities that he mentioned? It’s great getting a property that could appreciate, but his information was about income generating properties. I am guessing he has a pretty good idea of the amount of rent one could charge, if he has time I would like to see a ballpark figure of that. Good point. Referencing back to the property examples in the article, a one-bedroom’s average rent in Calgary is CAN$1011 per month, unfurnished. A three-bedroom would average CAN$1923. In Regina, a one-bedroom unit would average CAN$911 per month, while a three-bed unit would go for CAN$2021.